Trials on plants, cells, seeds, small animals and humans using non-contact healing have proved that healing therapies are not subject to the placebo effect. Sceptics always claim that healing and many complementary therapies only work through the ‘placebo effect’. Their argument is that people who have a treatment just believe that they feel better. The research has found that Reiki, healing, hypnotherapy, reflexology and even yoga, as well as other therapies are effective and not just placebos. To prove their point the researchers at the University of Northampton used plants, cells, seeds, small animals as well as humans to test non-contact healing in a series of separate trials. The results uncovered a fascinating phenomenon: When ‘healing intent’ was given to each of these categories, they produced an independent positive result. The evidence shows that healing intention can improve human wellbeing, and change the behaviour of animals, plants, seeds, and cells in culture, to an extent that was statistically shown to be very unlikely to be due to chance. Sue Knight, chief executive of the Confederation of Healing Organisations, the charity advancing the practice of Healing, commented: ‘This groundbreaking scientific evidence has dispelled the notion that healing’s effectiveness is just a ‘placebo effect’ and is crucial recognition of the fact that healing intent can make a difference to wellbeing. The peer review published research was recently presented to MPs in Westminster by the University of Northampton and the Confederation of Healing Organisations. The Confederation of Healing Organisations is the leading charity advancing the practice of Healing: promoting its benefits as a recognised complementary therapy by providing education, research and information to a wider audience of Healing and healthcare practitioners, and society as a whole. The CHO’s website is an information hub of news, case studies and insights about Healing within the UK and internationally. Last September 52 year old Bron stood on a table and as she was climbing down on to a chair she missed her footing and went over backwards. She fractured her spine and had to have four months off her job as a Learning Support Manager at a local Woking school. In January she was signed off by the doctors and physios and went back to work part-time, but her back was still so painful that she kept taking painkillers. ‘A colleague suggested reflexology, and I must admit I was sceptical at first,’ Bron explains. She looked on Google and found Julia Wood (also in Woking). ‘Julia was lovely and very helpful. At the first session the side of my foot which corresponds to my back was painful, but it was ‘good’ pain. Gradually it eased off and when I go for reflexology now it doesn’t hurt at all. 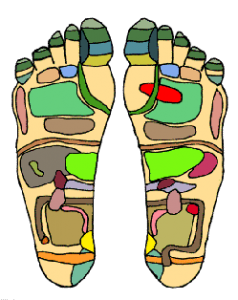 ‘The first session of reflexology can make you feel quite unwell and I was glad that it was a Friday because I just felt completely wiped out the next day. I gradually began to feel much better, but after six sessions I came off the painkillers. ‘Just this week I had bursitis (a painful swelling) in my hip which had flared up, so I arranged to go and see Julia. After just one session it was much easier to put my weight on the hip. Julia Wood is a member of the Association of Reflexologists, and she practises in Woking, Surrey, but is happy to travel to clients’ homes to give treatments. She says, ‘Reflexology can also help greatly for relaxing clients who come to me with stress-related problems or illnesses. Some clients have reported a reduction in tension, improved general well-being and better mood with clearer thoughts. Many people know aromatherapy as a relaxing massage with oils. But it’s much more than that. You can use essential oils in a variety of ways: in an oil burner, in massage oil, in the bath, in a spray bottle. They can form part of your first aid kit when travelling. See the wide range of aromatherapy oils at Neals Yard by clicking here. Lavender oil – there’s so much you can do with it, especially on holiday. You can apply it to stings and bites to ease itching and soreness. You can put a few drops in the bath to relax before bed, or if you can’t sleep you can put some on a tissue and leave it close to your face. The soothing vapours help you to sleep, or you can use it in a spray bottle as air freshener or burn to create a relaxing and soothing atmosphere. Tea tree is the other must-have oil in my bag. It’s antiseptic and has a strong pungent ‘clean’ smell so it’s great for cleaning – put a few drops in water and clean up your phone, your computer and other surfaces or even your kitchen. Put a few drops in the bucket when you clean your floor or use it in the bathroom to dispel other odours. Tea tree is also antifungal and can be used diluted in water or in oil on athlete’s foot, or a few drops in a bidet or shallow bath are good for thrush. Both lavender and tea tree oils can be inhaled in steam when you have a cold, cough or flu. Boil the kettle and put the steaming water in a bowl with a few drops. Essential oils can be inhaled in steam, used in a compress or poultice, massaged in, put in the bath, burned in an oil burner, put in a spray bottle, or used in water to clean. They are very strong and should not be taken internally. They should be dispersed with the hand in the bath and some people suggest mixing them in milk before adding to the bath. Clary sage oil is great for period pains – mix in oil and massage on your stomach. It also eases depression – put on a tissue and breathe in the pungent aroma. Eucalyptus oil is excellent for clearing blocked noses and can equally be put in the bath to steam. Frankincense oil is known for being uplifting, soothing stress and anxiety, and for its rejuvenating properties on the skin. Ginger oil helps to stave off travel sickness – just sniffing the bottle will do. It also helps to warm the muscles if you massage it in, and is great for circulation. Dilute very well. Juniper oil has a reputation for slimming as it is a natural diuretic. A few drops in the bath can soothe a hangover or in massage oil it can ease aches and pains. Peppermint oil is an excellent oil for many conditions, but it is incredibly strong so be careful with it. It is excellent for nausea, but most experts do not advise taking internally. Maggie Tisserand in her book Aromatherapy for Women suggests putting two drops in a spoonful of honey and add hot water. You could also put a few drops in an oil burner and breathe in the vapours. Dispersed in water or lotions peppermint soothes and cools hot, red, and sore feet or athlete’s foot. Mandarin oil in carrier oil helps to prevent stretchmarks and scars. Rose oil is made from the petals of the flower, and has the most beautiful aroma. It is an expensive oil but it is antiseptic and healing. It is also known to be uplifting and helpful for depression, stress or insomnia. Used diluted in a carrier oil it is particularly effective for the skin, smoothing out wrinkles and puffiness, and moisturising dry or sunburnt skin. Rosemary oil wakes you up so the best way to use it is to have a bath and breathe in the vapours. It is also good for tired legs – so mix in a carrier oil and massage in. Recent research has shown that rosemary oil enhances cognitive memory. Ylang ylang can ease depression, so keep some on a tissue tucked into your clothes so that you can breathe it in, or put a few drops in a bath.